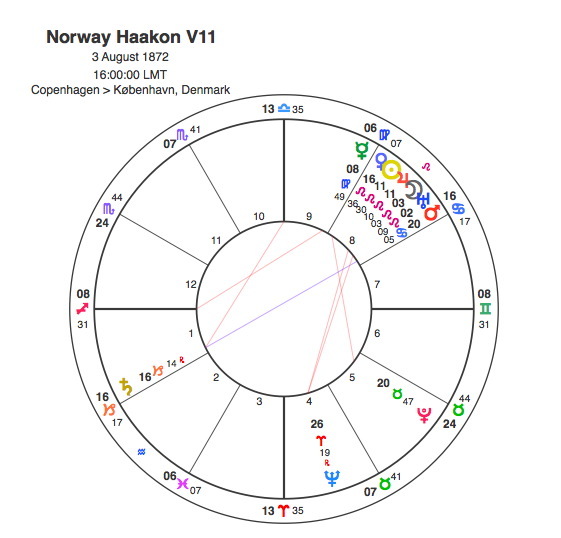 King Haakon V11 of Norway had an extraordinary birth chart, 6 planets in the 8th house with 5 of them all in conjunction in Leo including both Sun and Moon. With that much Leo it would be tempting to think he was King by divine right but Haakon was one a very small band of elected monarchs. Haakon was born a Danish prince but after the Union between Sweden and Norway was dissolved in 1905, the new Norwegian government offered him the role of monarch. He was flattered but declined to accept the offer without a referendum to show whether monarchy was truly the choice of the Norwegian people. He ascended to the throne after receiving 80 % of the vote. A stellium or multiple conjuntion of planets in one sign usually suggests a consistency of character and this one includes an exact Sun / Jupiter conjunction so Haakon reigned for over 50 years and whilst his duties were largely ceremonial he was always a popular figure. One result of such a close concentration of planets would be a powerfully concentrated watershed period of the life when Pluto comes to the stellium by transit. When important planets are in early Leo it’s interesting to look at the person’s wartime experience. King Haakon had two very close conjunctions, one between the Moon and Uranus 2 – 3 degrees, the other with the Sun and Jupiter at 11 degrees. Pluto was conjunct Haakon’s Moon from August 1939 at the very start of the war to June 1942. Norway was invaded in April 1940 but a delay in the German forces reaching Oslo allowed the Norwegian royal family to escape. The Germans demanded that Haakon accept their government and appoint their man as prime minister but this was refused. The royal family were evacuated to London but the king’s stand against the invading forces and his continued support for his country from England inspired many Norwegians who wore clothing or jewellery made from coins bearing Haakon’s “H7” monogram as symbols of resistance to the German occupation. After the end of the war, Haakon and the Norwegian Royal Family returned to Norway to cheering crowds in Oslo on 7 June 1945, exactly five years after they had been evacuated. Pluto was conjunct Haakon’s Sun and Jupiter from 1945 to 47. This is like an astrological wartime story for 5 year olds. There was a great king ( stellium in Leo ) but some bad people ( Pluto ) came and kicked him ( Uranus ) out of his country ( Moon ) but it was all fine in the end and when he returned ( Sun ) all the people were very happy ( Jupiter ). All so simple that no-one would believe it. Astrological symbolism is usually very simple, its just that we are so complicated we can’t see it.